Giant Robot was a bi-monthly magazine of Asian and Asian American popular culture founded in Southern California in 1994. It was initially created as a small, punk-minded magazine that featured Asian pop culture and Asian American alternative culture, including such varied subject matter as history, art, music, film, books, toys, technology, food and skateboarding. The publication grew from its original format—a small, photocopied zine, folded and stapled by hand—to its current full-color format. Giant Robot was one of the earliest American publications to feature prominent Asian film stars such as Chow Yun-fat and Jet Li, as well as Asian musicians from indie and punk rock bands. The coverage later expanded into art, design, Asian American issues, travel, and much more. In the late 1990s, Giant Robot expanded their endeavor to an online retail store selling artist goods, designer vinyl dolls, mini-figures, plush dolls, stationeries, art, T-shirts, and many creative goods. The success of the commercial website enabled the establishment of a brick-and-mortar retail store in 2001; first in Los Angeles and later in San Francisco. A third store, called GR2, was opened in Los Angeles, and features work by young contemporary artists. Giant Robot further expanded to a fourth store in New York City, and a fifth in Silverlake, as well as a restaurant called gr/eats, also in Los Angeles. The GR2, San Francisco, and New York locations feature monthly art exhibitions from up and coming and established artists. In 2007, Giant Robot published its 50th issue and celebrated with an art exhibition at the Japanese American National Museum titled, "Giant Robot Biennale: 50 Issues." A follow-up exhibition entitled "Giant Robot Biennale 2: 15 Years" was held at the museum in 2009. Nakamura and Wong are featured on the DVD release of the collection of animated short films The Animatrix, discussing anime in the Making of the Animatrix documentary. As of 2009, the Silverlake store has closed. The New York store closed in 2010 and the San Francisco store closed in 2011. Currently, Giant Robot has an association with Lost Weekend Video in the Mission District of San Francisco where they opened a pop-up shop. In 2010, Giant Robot presented Zen Garage at the Japanese American National Museum featuring the Scion xb Famicom Car designed by Eric Nakamura, and will also present Giant Robot Biennale 3 in 2012. The last issue of the magazine, #68, was released in February 2011 featuring the work of Luke Chueh on the cover. 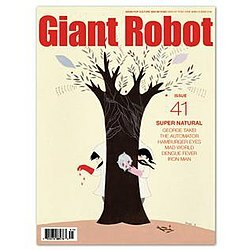 Also in 2011, Giant Robot launched their new website and updates content including articles, video, and products daily. On September 22, 2012, Eric Nakamura curated Giant Robot Biennale 3 at the Japanese American National Museum. The opening night brought in over 1500 people. The exhibition features the works of Rob Sato, Deth P. Sun, Ako Castuera, Eishi Takaoka, Saelee Oh, Sean Chao, Albert Reyes, and Zach Gage. Using figures designed by Uglydoll creator David Horvath, Nakamura curated Project Remix, a custom vinyl show with over 80 artists from seven countries—including the rare combination of both established customizers and fine artists. Special additions to the exhibition include an original piece from Japanese painter Masakatsu Sashie as well as arcade machines running Jeni Yang and Beau Blyth’s new indie video game, Catburger. On April 19, 2014, Eric Nakamura and Carin Adams curated SuperAwesome: Art and Giant Robot at Oakland Museum of California. Artists Included: Ako Castuera, Sean Chao, David Choe, Luke Chueh, Hamburger Eyes, Andrew Hem, James Jean, Kozyndan, Masakatsu Sashie, Shizu Saldamando, Rob Sato, Amy Sol, Deth P Sun, and Adrian Tomine. The exhibition ran until June 27, 2014. On April 18, 2015, Eric Nakamura curated Samurai! at Worcester Art Museum in Worcester, Massachusetts. The exhibition features samurai armor and contemporary art. Artists include: Murals by Andrew Hem, Mari Inukai, and Audrey Kawasaki. On view: Miya Ando, Esao Andrews, Shawn Cheng, Josh Cochran, Moira Hahn, Jed Henry, James Jean, kozyndan, Mu Pan, Ferris Plock, Stan Sakai, Masakatsu Sashie, Rob Sato, Yuko Shimizu, Katsuya Terada, and Kent Williams. The exhibition will run until September 6, 2015. ^ Lou Fancher (April 14, 2014). "Giant Robot magazine feted in new Oakland exhibit". Mercury News. Retrieved 3 December 2015. ^ "Giant Robot Biennale 2: 15 Years". Japanese American National Museum. Retrieved October 21, 2013. ^ "Giant Robot - CLOSED - East Village - New York, NY". Yelp.com. Retrieved 2013-10-21. ^ "GRSF « Giant Robot". Giantrobot.com. Archived from the original on 2013-08-12. Retrieved 2013-10-21. This page was last edited on 2 April 2018, at 01:27 (UTC).